Photographs by Mark HertzbergMike Rupnow working as a linesman in a freshman football game in Racine. 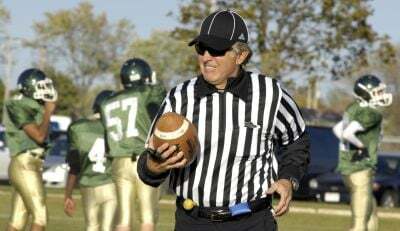 Mike Rupnow works as a referee at a freshman high school football game in Racine. Miek Rupnow signals a touchdown. Mike Rupnow works as a referee at a freshman football game in Racine. Mike rupnow working at Miller Park. Mike Rupnow checks bags as fans enter Miller Park. Mike Rupnow is retired. Tell that with a straight face to anyone who looks at his calendar. Sports were a recreational and competitive outlet for Mike Rupnow when he grew up. He played baseball, basketball and tennis at Menominee Falls North High School. Sports became his profession in 1983 when he moved to Racine as activities director at Park High School. Now Rupnow enjoys sports as retirement careers, following his retirement as activities director of J.I. Case High School in March 2011. He had served as principal of Knapp School, and as a sub-school principal at Park before going to Case. His only firm plan following retirement was to continue to referee baseball, basketball and football. The other stuff just happened. Consider this schedule juggling act: Rupnow may be called to substitute teach or administrate at a Racine Unified school during the day, before working as an usher at a Milwaukee Brewers night game, before waking up at 5:30 a.m. the next morning for his twice-weekly stint changing pin placements on the greens at the Ives Grove golf course on Highway 20. Rupnow began officiating baseball and basketball games in 2000, after Nick, the middle of his three children, graduated from high school. He added football to the mix last fall. He officiates the three sports throughout southeastern Wisconsin. A Brewers fan, he attended 20 games a year. Conversations with two ushers led to his applying for a job as an usher. 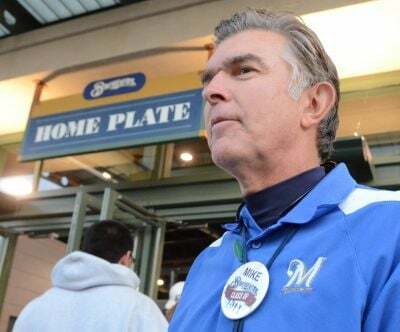 He worked 50-60 games at Miller Park each of the last two seasons. Rupnow thinks that both his love of the game and his past career helped him get the job. “I had a chance through my background in athletics and supervision in athletics, working with people, adults and kids, and I’m a fan of baseball. I enjoy watching and talking baseball,” he said. Rupnow’s perspective on officiating changed once he donned his own black and white jersey. He was concerned with how his coaches represented their school. “I would tell coaches to back off. Not in the heat of a contest, it would be afterwards in our discussion. I certainly appreciate a person’s passion for the event and the job, and what they are trying to do, but I would try to get them to remember they are representing the school and are a model for the kids. As a referee, he knows that perfection, or the perception of perfection, can be elusive, “You always say you’re going to make 50 of the people happy at the games. When both coaches come up and say to you, ‘Good game, thanks,’ and so forth, I guess that’s the most satisfying thing you can get. Maybe you’ll walk to your car and parents will say, ‘Good job, ref,’ but not real often. He is happy to break 90 when he golfs after work at Ives Grove. In his spare time, he plays tennis more often, whether indoors in winter or outdoors during the summer.